All the words were taken from the SB English in Mind 3 (New Edition), but can be used just as practice to train negative prefixes. Cut the all the cards and give a set of cards to individual students or to small groups of 2-3 people. Organise a competition: who is the first to match the pairs. The above printable, downloadable handout is meant for business/professional students, high school students and adults at Pre-intermediate (A2), Intermediate (B1) and Upper-intermediate (B2) level. 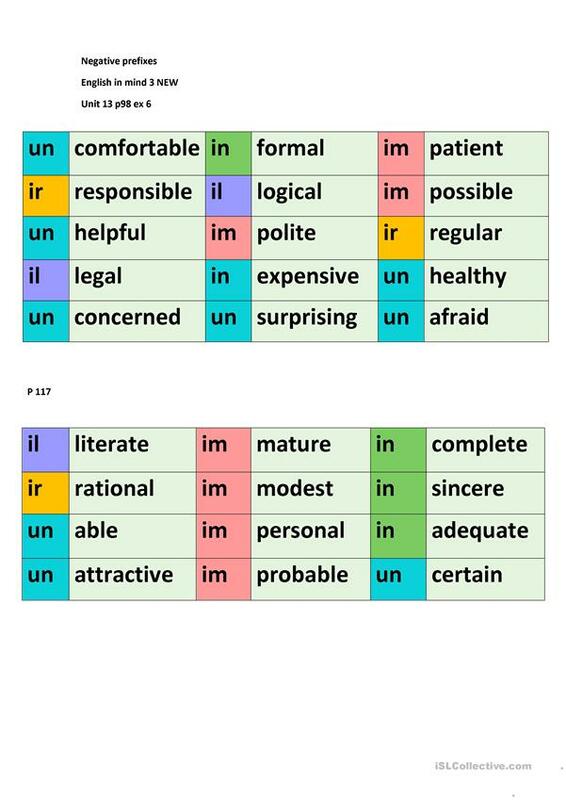 It is a useful material for practising Prefixes (e.g. A, UN, IM, DIS, MIS, EN, etc. ) in English, and is useful for working on your groups' Spelling and Writing skills. It includes the solutions, too. zippa is from/lives in Russia and has been a member of iSLCollective since 2012-11-05 11:15:12. zippa last logged in on 2018-03-06 21:22:51, and has shared 19 resources on iSLCollective so far.